haha welcome back. summer was spent back in singapore, sketching. now i'm in my 5th week of 2nd year, and i think i feeling a little improvement. 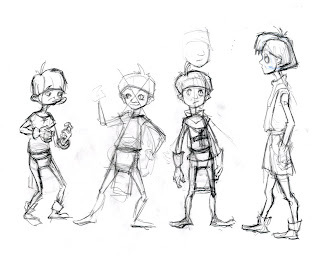 here's some roughs for char design class. 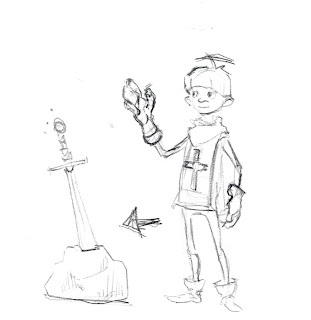 its suppose to be for weight lift toss, so i thought i'd make a squire lift both the sword AND the stone. 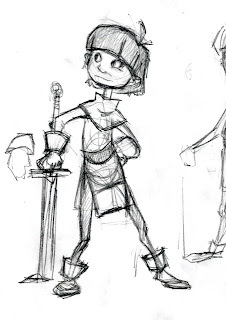 in all honesty, i had that idea a week before we saw the sword in the stone example in lecture, but i think it ended up having a greater influence on me. the first one was what i had in mind the week before, and the last one was the final one i decided to go with.